Tether yourself to your keyboard, because it's time we talked about Us. Jordan Peele's masterful horror movie centers on the Wilsons, whose family vacation takes a turn when mysterious and murderous doppelgängers show up on their doorstep. Us is full of Easter eggs and references -- to everything from Goonies to Hitchcock -- and layers upon layers of deeper meaning, social commentary on race and class, politics and technology. Since Peele will likely never fully explain the film, I'm going to attempt to parse out some of it. Maybe I'm right. Maybe I'm wrong. Maybe that's a binary that's not helpful when it comes to analyzing Us. Major spoilers below, so proceed with caution. Us begins in 1986 with a promotional video for Hands Across America, the benefit that aimed to create a human chain across the U.S., citizens united together hand-in-hand from New York City to California to raise money for the country's homeless and hungry. It is a symbol of the American people at our most ideal, of coming together to help our fellow man -- no matter how naïve or how ill-fated the fundraiser turned out to be. Hands Across America is inconceivable today. Our current climate is one rooted in fear and anger more than any sense of optimism, feelings that grow deeper each day as the left and right shift further and further apart. Those feelings are manifest in The Tethered, an external representation of the darkness within us all, the suppressed id powered by hatred and which has come out (in the film, literally from underground) to take over. "The feeling that we all feel we are the good guy in our own story prevents us from facing our demons," Peele told the Los Angeles Times, elaborating in a post-screening Q&A at SXSW: "We are in a time where we fear the other. Whether the mysterious invader who might kill us or take our jobs, or the faction that doesn't live near us that votes differently than we did. Maybe the evil is us. Maybe the monster that we're looking at has our face." Lupita Nyong'o's doppelgänger eventually explains that The Tethered are the result of government experimentation. We, meanwhile, may not have emerged from secret laboratories, but we are more than ever the product of our political climate and the state of our government. Us shows how these demons become consuming on a personal level (like, a home invasion), then spread to a national scale. It's not Peele making a "bad people on both sides" argument, but that we all have a disposition to bad behaviors within ourselves. People fear the other, but it's what's inside us -- that hatred, that false sense of righteousness -- that can lead to our own destruction. Within the movie's logic, it's seemingly easier then for The Tethered to eliminate people who already lean into those impulses. Hence, why the Tylers -- Kitty and Josh Tyler (Elisabeth Moss and Tim Heidecker), the bitter, self-centered friends -- are so easily offed. (Also, to upend the trope of the black person being the first to die in horror movies.) The Wilsons, meanwhile, are able to show empathy and compassion and have an outlook larger than their individual selves, uniting in the face of oblivion, which allows them to defeat their Tethered. The former, unfortunately, prevails in Us, culminating in the film's final shot: A hellish redux of Hands Across America, The Tethered only united hand-in-hand once they've ensured mutual destruction. Adelaide is Red and Red is Adelaide. 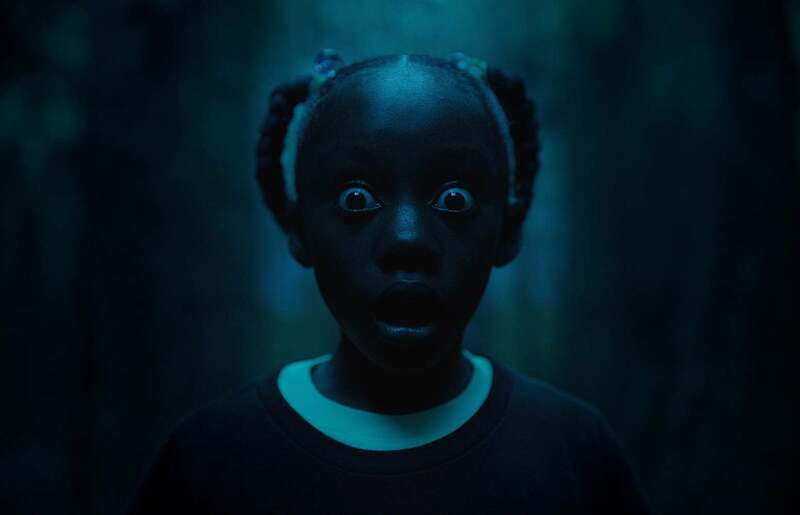 The film's prologue shows Nyongo's character, Adelaide, as a child encountering something traumatizing in a boardwalk funhouse. Soon after, it is revealed via flashback that what she encountered was herself, or the Tethered version of herself, known as Red. It's not until the final moments of the movie that Peele unveils his major twist: In that moment, young Red chokes Adelaide and takes her place above group, leaving the real Adelaide to grow up among the Tethered. The character we'd believed was Adelaide the whole movie is actually a Tethered. The revelation both answers a number of questions and poses even more. The seeds for the twist are planted throughout Us, the biggest hat tip to it being each of Nyong'o's characters speaking abilities. When "Adelaide" (Red) returns to her parents after the encounter, she must relearn to speak with a therapist who thinks she is experiencing PTSD. This is, in fact, Red learning to speak for the first time. Meanwhile, "Red" (Adelaide) is the only Tethered with the ability to speak, with her distorted rasp possibly the result of damage from being choked. So, is Red good now and Adelaide bad? Another binary that's perhaps not so useful. Off of what I explained above, I believe the twist shows the power of generational rehabilitation, or vice versa. Red is born into the darkness, but as Adelaide, is nurtured and raised in love and changes for the better. Adelaide stews in her hatred and anger and is consumed by that side of herself. She stokes the feeling of betrayal and entitlement among The Tethered and is praised as a god, allowing her to lead them in a takeover. (Who else does that sound like?) At least, that's what I took from my first screening of Us -- and this is a movie that requires multiple viewings. So, what did you make of it all?